Staphylococcus is the group of Gram-positive bacteria that divides in variable directions (multiple axes) and forms the assembly or clusters (grape like). They are round shape and responsible for causing the multitude of diseases. On the counterpart Streptococcus are also Gram-positive bacteria, present in respiratory tract and mouth. They are responsible for causing rheumatic fever, impetigo, scarlet fever, tonsillitis, while some other species though commonly found in the throat but does not cause any human disease. Bacteria are the most widespread microorganisms and cause many different diseases. Though not all species of bacteria are harmful, some may even do not mark their presence. In earlier days it was not possible to determine the type of infection and the underlying source, but the researchers, techniques made it possible to know about them along with the cure and reasons for an occurrence. So the person can get the suited medicines, treatment and can follow the preventive measures. In this article, we will focus on some important points which distinguish both kinds of bacteria. Meaning Staphylococcus are gram-positive bacteria, forming clusters (grape like). These are found on the skin, till yet around 40 species are identified. Streptococcus are also gram-positive bacteria, forming a short chain of round cells. These are found in respiratory tract and mouth, till yet around 50 species identified of these type. Cellular arrangement The cells are arranged in clusters (grape-like). They are also present in pairs, short chains or tetrads. These show a single short chain containing round cells. Habitat Staphylococcus is usually found on the skin. Streptococci are present in the respiratory tract, mouth. Division In Staphylococcus division occurs in multiple directions. In Streptococcus division occurs in single direction. Growth requirement/ enriched media They do not require enriched media to grow. Require enriched media to grow. Hemolysis Beta hemolysis or no hemolysis. Either alpha or beta or gamma hemolysis. Disease caused Septic arthritis, surgical site infection, food poisoning, wound infection, meningitis, pneumonia, osteomyelitis, conjunctivitis, toxic shock syndrome, etc. Rheumatic fever, sore throat, pneumonia, wound infection, acute post-streptococcal glomerulonephritis, scarlet fever, blood infections, meningitis in newborns. Diagnostic test 1. Coagulase test. 3. Novobiocin sensitivity test. 1.Bile solubility test. 2.Optochin sensitivity test (S. pneumoniae). Staphylococcus hominis, etc. Streptococcus bovis. Catalase test (an enzyme that converts hydrogen peroxide into water and oxygen gas) Positive. Negative. Under the microscope Staphylococcus appears to be round in shape, forming a grape like clusters. As said before they are the Gram-positive bacteria and falls under Phylum Firmicutes. Staphylococcus is derived from the Greek word ‘staphyle‘ which means the bunch of grapes and ‘kokkos‘ means berry. But in general terms, Staphylococcus is known as ‘staph’ or ‘staff’ which is related to the illness ranging from mild to severe and do not require treatment. Till yet there are at least 40 known species. These reside on the skin and mucous membrane but are harmless to humans and other organisms. The most important features, while classifying the Staphylococci is their ability to produce coagulase, this enzyme supports in blood clot formation. This is done by S. aureus, S. hyicus, S. delphini, S. schleiferi, S. intermedius. S. aureus is catalase positive, which means it has the capability produce the enzyme catalase, which can convert hydrogen peroxide (H2O2) into water and oxygen. These bacteria may cause infection directly or by the production of toxins. The symptoms and signs of the infection of staph include the furuncle, boil with pus. The infected area gets painful, swollen and inflamed. These can be treated with oral, topical, or intravenous antibiotics, depending on the type of infection. Till yet no vaccine is available to prevent the infection. While another species called as S. pseudinternedius inhabits and may infect the skin of dogs and cats. S. saprophyticus species is a part of the vaginal flora and is mostly present in genitourinary tract causing infection in sexually active young women. S. epidermis is present on the skin but may infect the immunosuppressed patients. Staph infections can be prevented by proper hygiene, on any skin wounds. Proper handwashing, avoiding close contacts with infected individuals and maintaining hygiene on wounds, scrapes, and cuts. These are the Gram-positive bacteria, belongs to the Firmicutes phylum. As the division occurs in single axes, they form the short chains or pairs. The word is derived from the Greek word where streptos means ‘easily bent or twisted’ and kokkos means ‘berry’. They are oxidase and catalase negative and are facultative anaerobes. Till yet around 50 species of this genera are recognized. Streptococcus are categorized as – group A and group B. Group A causes scarlet throat, impetigo (skin infection), toxic shock syndrome, cellulitis and necrotizing fasciltis (flesh-eating disease), strep throat. Group B can cause pneumonia, meningitis in new born, blood infections, urinary tract infections. Antibiotics are used to treat such infections. Staphylococcus are gram-positive bacteria, present in the form of clusters (grape like) or sometimes in pairs, or tetrads.These are found on the skin, till yet around 40 species are identified. On the other side Streptococcus are also gram-positive bacteria, but they form a short chain of round cells. These are found in respiratory tract and mouth, till yet around 50 species are identified of these type. In Staphylococcus division occurs in multiple directions (multiple axes), even they do not require enriched media to grow. In Streptococcus division occurs in the single direction and form a chain like structure, they require enriched media to grow. Disease caused by Staphylococcus are Septic arthritis, surgical site infection, food poisoning, wound infection, meningitis, pneumonia, osteomyelitis, conjunctivitis, toxic shock syndrome, etc. While Streptococcus may cause Streptococcus rheumatic fever, sore throat, pneumonia, wound infection, acute post-streptococcal glomerulonephritis, scarlet fever, blood infections, meningitis in newborns. The diagnostic test of Staphylococcus includes – Coagulase test, Catalase test and Novobiocin sensitivity test whereas for Streptococcus detection Bile solubility test, Optochin sensitivity test (S. pneumoniae), Catalase test, Bacitracin test, CAMP test, Test of hemolysis are done. Some of the common pathogenic species of Staphylococcus are Staphylococcus epidermis, Staphylococcus aureus, Staphylococcus saprophyticus, Staphylococcus hominis, etc. and that of Streptococcus are Streptococcus bovis, Streptococcus agalcitae, Streptococcus pneumoniae, Streptococcus pyogenes, etc. Capable of showing antibiotic resistivity. 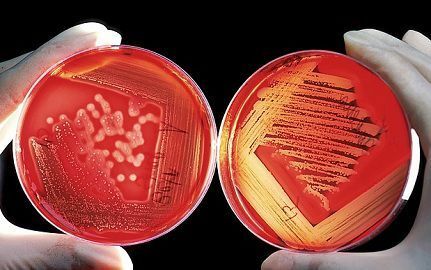 In this article we discussed and differentiated between Staphylococcus and Streptococcus, we found that both the genera are Gram-positive and are similar in shape and so-called as cocci, but their arrangement is different along with certain other features. These both are clinically important, as they cause the disease to humans.